Hop over to Donetto for brunch this Easter Sunday! 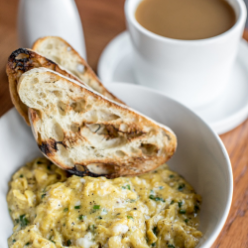 Bring the family to the west Midtown hotspot for special brunch service from 10 a.m. to 2:30 p.m., and enjoy menu favorites such as the cacio e pepe scramble, eggs in a basket or the fried chicken sandwich with calabrian chili and citrus aioli. Make your reservation by visiting www.donettoatlanta.com or calling 404-445-6867.